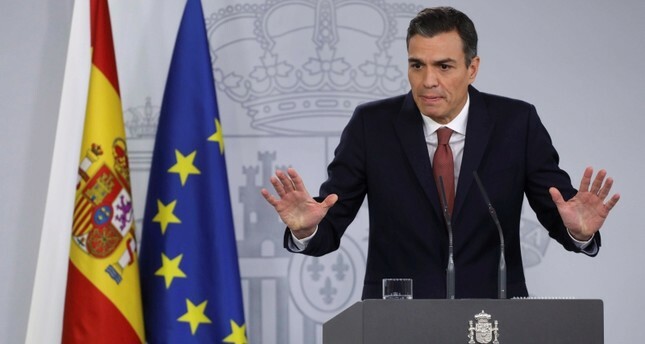 A man who owned an "arsenal of weapons" was arrested in September for threatening to kill Spanish Prime Minister Pedro Sanchez, officials said Thursday. The man was detained in the northeastern city of Terrassa in Catalonia, the region's Mossos d'Esquadra police force said on Twitter. The 63-year-old Spaniard wanted to kill Sanchez because he was furious at the prime minister's move to exhume late dictator Francisco Franco from his high-profile resting place near Madrid, Mossos spokesman Albert Oliva told reporters. He owned "a total of 16 weapons," he said. The arrest on September 19 only emerged Thursday after daily Publico broke the story, saying that among the suspect's weapons were sniper rifles and a submachine gun. It added that suspect is an expert marksman and a regular in shooting competitions. He was working as a private security guard and illegally improvised some of his weapons, the report added. The man, who has not been identified and is currently in custody, had "the clear intention to carry out actions against the prime minister and he was only lacking logistical support," Oliva said. As such, he looked for help in messenger chats and social media, saying he was "willing to make a sacrifice for Spain." Catalonia's high court said he is suspected of "conspiring to wage an attack against authorities using weapons." "We consider it an isolated incident," government spokeswoman Isabel Celaa told reporters, calling for "serenity and caution." According to a judicial ruling revealed by the high court, the suspect had asked a member of Spain's small, far-right party Vox for help with the killing via WhatsApp messages. In a statement, Vox said one of its local coordinators "alerted authorities of this plan," adding that the suspect was never a party member. Sanchez, who leads the Spanish Socialist Workers' Party (PSOE), has made exhuming Franco's embalmed body from the grandiose Valley of the Fallen basilica where he currently rests near Madrid one of his priorities since he came to power in June. The issue has taken center stage in Spain. Sanchez wants to move the former dictator's remains to a more discreet spot where it will be harder for Franco followers to pay homage.